Click on the links below to see the list of communes and flags within each province. 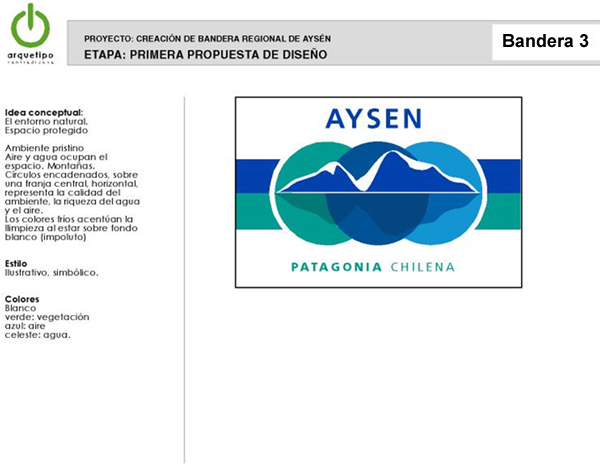 XI Region Aysén does not appear to have an official flag. The de facto flag consists of the regional coat of arms on a white field. It is similar to the previous flag, which was also unofficial. The 2008 photo taken at the National Congress building (in Commons at [https://commons.wikimedia.org/wiki/File:Regional_flags_of_Chile_in_the_National_Congress.jpg], as mentioned), shows a white flag with the essntially the same emblem [as the previous flag] but with some differences centered on it. 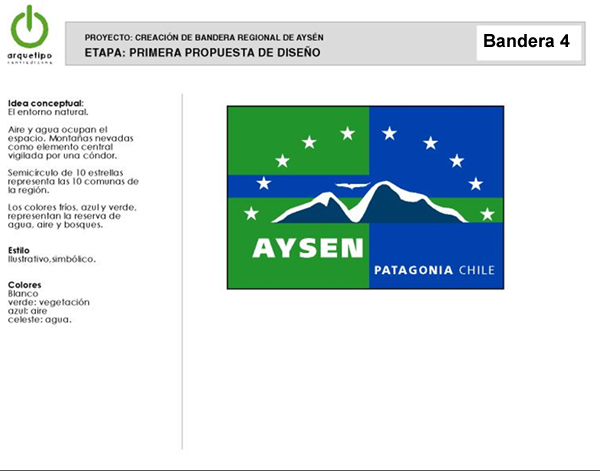 I received today from regional intendent the flag and shield of the XI Región-Aysén. Image available soon. The shield is one of the older of the Chilean regions and was adopted after a contest. The shield is named Cristal de nieve. The flag is unnoficial and has very limited use. There have been many attempts to create a new flag for the region. The Spanish Wikipedia article on the subject is at http://es.wikipedia.org/wiki/Bandera_de_la_Regi%C3%B3n_Ays%C3%A9n_del_General_Carlos_Ib%C3%A1%C3%B1ez_del_Campo; it says that in 2005 the regional govenrment commissioned Arquetipo, a design company, to come up with flag designs to be later subject of an official plebiscite, which never happen. These designs, along with some documentation oabout which, were published online, and can still be reached as archived in http://web.archive.org/web/20130617092714/http://www.goreaysen.cl/goreaysenwebneo/index.aspx?channel=6108. Arquetipo presented 6 alternatives, some of them with variants. They all make use of the whole or part of 4 different logotypes, apparently also designed by the company. Green and blue, in variant shades, and white, are predominant in the set. In the Spanish Wikipedia article on this flag, it is mentioned that there is currently (as of 2012) going grassrots campaigning on to have a new flag adopted, regardless of all previous efforts by the regional government. The most prominent of such compaigns champions a 1:2 unequal triband of green, red, and darker blue with a large white snowflake overall, offset to the hoist — this design authored by one Hans Foitzick. This version shows a classic stylized/simplified snowflake, made of six “fishbone”-shaped branches drawn in constant-width stroke, with a dot on each corner of its enscribing hexagon. This device is placed on the flag with its enscribing hexagon renston on one of its sides. This version shows a what cannot be termed a snowflake, for lack of 6-fold symmetry: it is an asterisk with 16 spokes, alternating longer and shorter ones, the latters’ tips topped by a dot. This device is drawn in constant-width stroke and placed on the flag with four cardinal spokes aligned to its width and height. Flag design no.1 is a generic arrangment of varying elements and color, for which three examples are given. 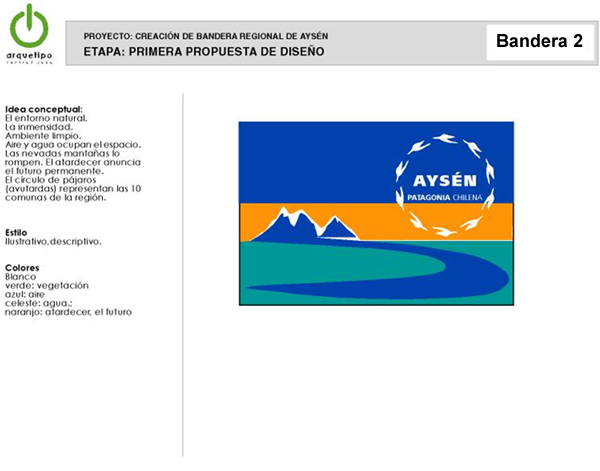 It is shown at http://web.archive.org/web/20130617092714im_/http://www.goreaysen.cl/GoreAysenWebNeo/CONTROLS/NEOCHANNELS/Neo_CH6108/Images/bandera1.jpg. Left: Blue background with 2-golored goose ring, contour logo, and "XI REGION - CHILE." Right: Teal background with blue goose ring, color logo, and "PATAGONIA CHILENA." Not much to salvage, is there? [But since I needed something to do while waiting for the first run I hope to participate in since college (expected outcome: Did finish. ):] This is the flag above, which I've based on Bandera 3. I guess it would work better on a longer flag, though. Flag design no. 2 is a sigle item, created from the color logo used as one of the options design no. 1. 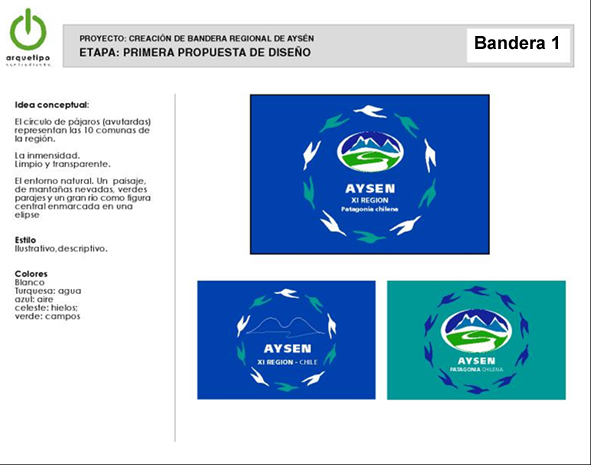 It is shown at http://web.archive.org/web/20130617092714im_/http://www.goreaysen.cl/GoreAysenWebNeo/CONTROLS/NEOCHANNELS/Neo_CH6108/Images/bandera2.jpg. This design has a vexillologic background: an unequal triband of dark blue, orange, and teal (approx. : 4+2+3); on it several elements of the logo were cast: On the top fly, taking up the blue and orange stripes, the ring of geese, in white, enclosing the lettering "AYSÉN" (properlly spelled, this time), bold extended, above "PATAGONIA CHILENA" with the 2nd word in a lighter face. On the hoist side of the orange stripes, the mountains from the logo, in blue with wide white edging; emerging from the mountain base the river in a wide dark blue swash enscribed fully in the teal stripe. This design has a vexillologic background: an unequal triband of dark blue, orange, and teal (approx. : 4+2+3). It could really work as a simple, yet distinctive standalone flag design on its own. Flag design no. 3 is a sigle item, created from the color logo used as one of the options design no. 1 (as also was design no. 2). It is shown at http://web.archive.org/web/20130617092714im_/http://www.goreaysen.cl/GoreAysenWebNeo/CONTROLS/NEOCHANNELS/Neo_CH6108/Images/bandera3.jpg. This design has also a vexillologic background: an unequal, but horizontally symmetric tetraband of white, dark blue, teal, and white (approx. : 2+1+1+2); centered on it three partly overlapping discs set along the flag's horizontal midline, fimbriated white where they meet the central stripes, and colored (from the hoist:) teal, darker blue, and light blue, the middle disc overlapping the other two, apparently tangent; the diameter of each disc is approx. half the flag's height. On this 3-disc ground, the mountain outline from the color logo used in design no.1, dark blue edged white, placed on the flag's horizontal midline and casting a shadow/reflection on the lower part, this rendered as a darker tone one each of the three discs. 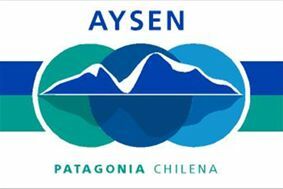 Along the top edge of the flag the word "AYSEN" (no accent mark) in dark blue, wide set capitals of the same modern serifless typeface, at medium weight, and along the bottom edge of the flag the words "PATAGONIA CHILENA" in teal, likewise wide set in capitals of the same modern serifless typeface, with the 2nd word in a lighter face. The lateral discs are not tangent "under" the middle one, after all, as I found out while creating the simplied version; it could really work as a simple, yet distinctive standalone flag design on its own. Flag design no. 4 is a sigle item, created from the color logo used as one of the options design no. 1 (as also was designs no. 2 and 3). 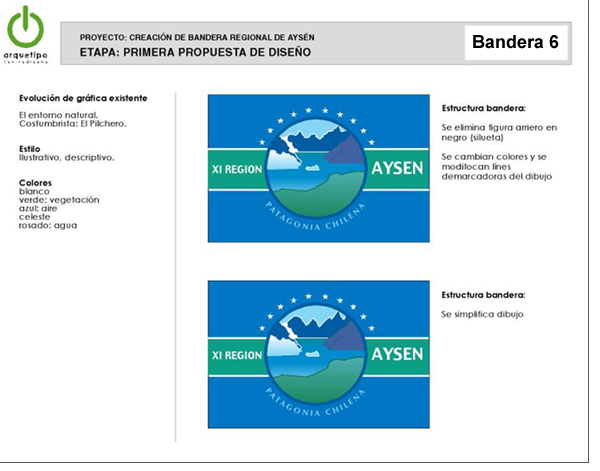 It is shown at http://web.archive.org/web/20130617092714im_/http://www.goreaysen.cl/GoreAysenWebNeo/CONTROLS/NEOCHANNELS/Neo_CH6108/Images/bandera4.jpg and http://commons.wikimedia.org/wiki/File:Flag_of_Ays%C3%A9n,_Chile_%28proposal,_2005%29.svg, as redrawn by Wikimedia user B1mbo. This design has also a vexillologic background: an vertical diband of green and dark blue with an overall pair of horizontal stripes, dark blue and green, counterchanged. On this background, the mountain outline from the color logo used in design no.1, with an additional condor in flight, rendered white, the mountain dark blue edged white, placed on the bottom edge of the lowest of the middle stripes and extending to the other; an arc of ten five-pointed regular white stars pointing up (possibly standing for the 10 communes of the region like the geese of design no. 1 but not stated in the official description) surrounds the mountain. 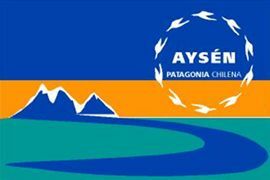 Under the mountain, on the green area, the word "AYSEN" (no accent mark) in dark blue, set with terrible kerning in white capitals of the same modern serifless typeface, at demi bold weight, and along the bottom edge of the flag, on the dark blue area, the words "PATAGONIA CHILE," likewise set in white capitals of the same modern serifless typeface, with the 2nd word in a lighter face. This design has a vexillologic background: it could really work as a simple, yet distinctive standalone flag. Flag design no. 5 shows in the plate actually two different designs (see http://web.archive.org/web/20130617092714im_/http://www.goreaysen.cl/GoreAysenWebNeo/CONTROLS/NEOCHANNELS/Neo_CH6108/Images/bandera5.jpg — their only shared trait is the presence of a dark blue-edged, centered disc showing the main image of the 1986 emblem (horses, rider, dog, mountains, and fjord), with slight differences. 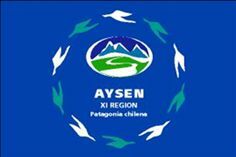 The first variant is a white flag with a dark blue-edged disc showing the the main image of the 1986 emblem; it is horizontally centered but closer to the lower edge of the flag to make room for black lettering, in two lines, reading "AYSEN" and "XI REGION" — misspelled with no accent marks, set in bold serifless capitals. 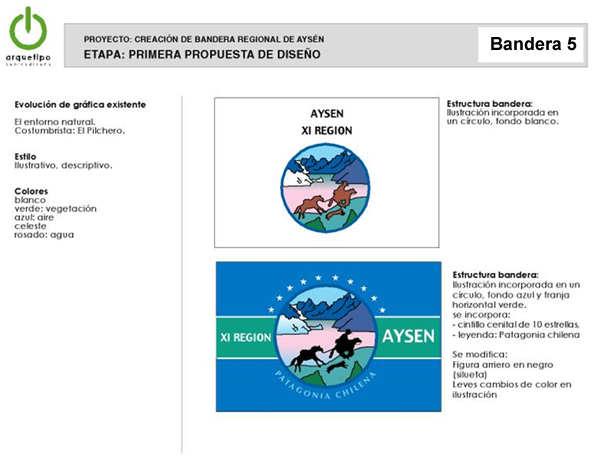 The image from the emblem shows a white glaciar, purplish dark blue mountains, light brown mammals (i.e., dog, horse, mule, and human), teal grass, green forground things (What are these, tree tops? ), and the water surface of the fjord in a horizontal teal-to-pink gradient. Diameter of the disc is approx. 3/5ths the flag's height. The second variant is a blue flag with a horizontal stripe on it, teal fimbriated white, and the emblem goes on top, centered, also in a dark blue edged disc, barely visible against the background. The image from the emblem shows a white glaciar, purplish dark blue mountains with the closest one more purplish, black mammals (i.e., dog, horse, mule, and human), teal grass, green forground things, and the water surface of the fjord in a horizontal teal-to-pink gradient. Around the disc, an arch of 10 white stars above, and the lettering "PATAGONIA CHILENA" curved below. Diameter of the disc is approx. 2/3ths the flag's height. On the teal stripe white lettering reading "XI REGION" on the hoist side and "AYSEN" — all lettering in white serifless bold capitals. A blue flag with a horizontal stripe on it, teal fimbriated white, and the emblem on top, in a centered, dark blue edged disc, barely visible against the background. The image from the emblem shows a white glaciar, dark blue mountains with the closest one purplish, grass in a horizontal acqua-to-teal gradient, and the water surface of the fjord in a horizontal blue-to-cyan gradient. Gone are all the figures (dog, horse, mule, and rider), as well as the pointy foreground elements. Around the disc, an arch of 10 white stars above, and the lettering "PATAGONIA CHILENA" curved below. Diameter of the disc is approx. 2/3ths the flag's height. On the teal stripe white lettering reading "XI REGION" on the hoist side and "AYSEN" — all lettering in white serifless bold capitals. The first variant shows rounder and simpler mountain crest edges. The secont variant shows a slightly narrower stripe, proportionally off center (i.e., located so that the lower edge of the stripe is the same in both variants). This UFE (unidentified flag or ensign) might be related to the 2005 government effort to commission a new regional flag. Sadly there is no context.